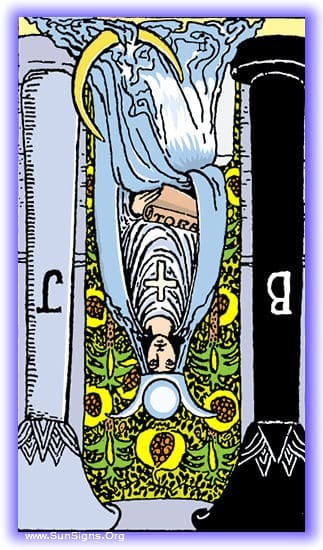 The High Priestess tarot card from the Rider Waite deck represents the pinnacle of quiet wisdom, of knowing. While her consort the Magician is about fevered action and creation, the High Priestess is about patience, and quiet knowledge. She does not seek challenges or problems; she lets them come to her. She does not create drama, she quietly observes it and extinguishes it. There is no need for action in the High Priestess, she knows that all the must be done has been done, and what needs be done will present itself in time. Those around her may accuse her of not caring, but such is not the case. She has embraced the power of powerlessness. Powerlessness in this case is not the inability to do anything about a situation. But it is the knowledge that you have done all you can and must, and that the rest is in the universe’s hands. 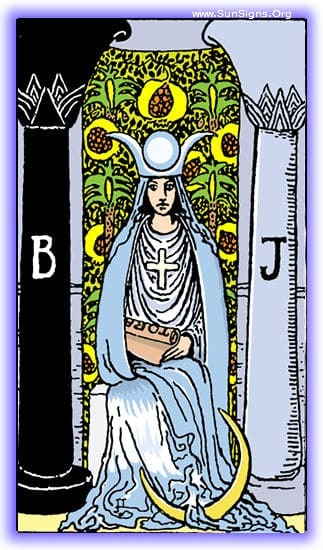 The High Priestess of the Major Arcana may not know the next action to take, but it does not concern her. Quiet observation will let her know the solution when it comes, and her calm demeanor will save her the energy to act when she must. Quiet, contemplative calm. A state of well-thought out inaction, not laziness or avoidance, but knowledge that all that must be, has been. The secrets of the world wait to be unlocked, but only if the path to them can be found. She sits quietly observing all paths, waiting for the way to reveal itself. You have been in your time of quiet, and it has been the correct course of action. Your calm and peace has served you well, and allowed you to negotiate otherwise turbulent waters in serenity. You have been collecting the correct information, and have created no unnecessary waves in the water. Not by fear of action, but of knowing that this was the correct path to take. This time has passed, and now it’s time to apply what you have discovered. It is time to let go of action, and to embrace inaction. Quiet observation and wise distribution of energy is the key at this time. Patience is the only virtue that will see you through your current conundrum, patience and calm. Let those who would create chaos or move in useless furtive action do so, set yourself apart from it, doling out your calm observations and knowledge to those who would listen. It is likely that a time of turbulence is ahead, and it will be a time that you would best observe in quiet. It is both a warning and a promise. If you navigate the waters ahead with a peaceful centered mind, giving no word unasked, asking no questions but always watching, you will move through it as unscathed as possible. Frantic pointless action, feeling as though something MUST be done about all things. She knows where not to go, not what to do, and thus feels as though she must do all things. Forever stressed, never resting, always meddling, the High Priestess reversed has forgotten the power of powerlessness, and is always attempting to control things she cannot. Much energy is wasted here. You have been frantically trying to control your environment, to control the situation around you and do everything you can. It has been pointless, leaving you feeling exhausted and drained. With no progress having been shown for all your effort. Take heed of this, for you are causing yourself harm by these actions. Either at this very moment, or very very soon, you will find yourself in a situation that you feel demands you take some form of action. You will feel that if I just do ‘this’ or ‘that’, or you will feel obligated to act. Do not fall for it, do not be tricked. If you apply your energy to this you will only drive yourself to exhaustion. Find a place of calm to rise above the coming storm, and you will ride it out. Pay attention to the days ahead, you will reach a point where you have done all you can, and any further action would be pointless, and potentially harmful. When this event comes to pass, it will be time for you to retreat from action. Enter the place of quiet observation and withdrawal. The thing to concern yourself with is that you must recognize this time, as it will not stand out and be obvious. Previous How To Perform Sensory Deprivation?